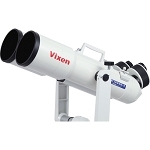 Vixen Optics gives you a complete observational rig with the BT126SS-A 126mm f/5 Binocular Telescope with Pro Accessory Package. The BT126SS binocular telescope features achromatic glass lenses combined with anti-reflection fully multi-coated optics that maximize light transmission while virtually eliminating chromatic and spherical aberration. The large 126mm objectives and 625mm focal length produce a fast f/5 optic for astroimaging or photography utilizing eyepiece imaging systems. The large lenses also ensure copious amounts of light gathering ability versus smaller optics. Views through the telescope are bright and clear with true color rendition and high-contrast, and objects can be brought into sharp focus without comas or halos. Two ultra-wide angle 14mm eyepieces, that are included, produce a competent mid-range 45x magnification, and are compatible with most 1.25" eyepiece filters to further enhance the view. Each ocular is individually focused for precise pin-point views for every user, and accepts any 1.25" telescope eyepieces for changing the magnification to fit specific observation needs. The binocular is designed with the eyepieces set at a 45° angle to make long observation sessions comfortable whether viewing celestial or terrestrial subjects. Viewing with both eyes open eliminates the fatigue normally associated with holding one eye closed, as with traditional telescopes. Similarly, the angled oculars are more comfortable, especially when the scope is aimed at or near the zenith. With both eyes open, true stereoscopic vision is maintained, providing a rich depth of field rarely experienced during astronomy sessions. 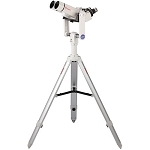 A manual alt-az mount is specifically designed for Vixen binocular telescopes and provides an easy way to find and track near and deep sky objects, or more earth-bound subjects, without excessive shake. Finding your subjects is made faster with the included XY Red Dot Finder that fits on the integrated shoe. Rounding out the platform is an adjustable-height aluminum tripod and a convenient accessory tray. 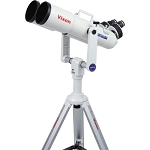 With a minimum height of 25" and a maximum of 39", observers of most sizes can comfortably use this telescope standing up or sitting down. 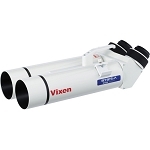 Vixen Optics' BT126SS-A 126mm f/5 Binocular Telescope features achromatic glass lenses and two 1.25" eyepiece holders that allow the observer to equip the optic with a wide range of astronomy eyepieces and enjoy a unique celestial or terrestrial observing experience. The achromatic lenses combined with anti-reflection fully multicoated optics maximize light transmission while virtually eliminating chromatic and spherical aberration. Views through the telescope are bright and clear with true color rendition, and objects can be brought into sharp focus without comas or halos. The binocular design with the eyepieces set at a 45° angle makes long observation sessions comfortable. Viewing with both eyes open eliminates the fatigue normally associated with holding one eye closed, as with traditional telescopes; and the angled oculars are more comfortable, especially when the scope is aimed at or near the zenith. With both eyes open, true stereoscopic vision is maintained providing a rich depth of field rarely experienced during astronomy sessions. 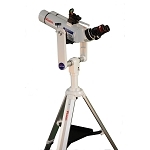 The dual optical tubes also enable the use of astrophotography/astroimaging equipment on one ocular while providing a perfectly-aligned guide scope. Views through the scope are corrected horizontally and vertically to enable its use as a powerful terrestrial observation platform as well. Each eyepiece is individually focused, providing superior clarity versus binoculars with center-focus systems. 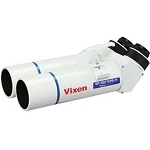 This 14mm version of Vixen Optic's SSW 83&Deg; Ultra Wide Eyepiece delivers an immersive observational experience through a combination of optics and coatings that work together to produce bright and clear images across the entire expansive field of view. Its performance starts with a seven-element lens design using high-transmission/low dispersion lanthanum and exotic glass which limits distortion (spherical aberration) and color fringing (chromatic aberration) for edge to edge sharpness with true color rendition. Complementing the glass are proprietary anti-reflection optical coatings which increase contrast and help transmit the light through the system with very little loss. 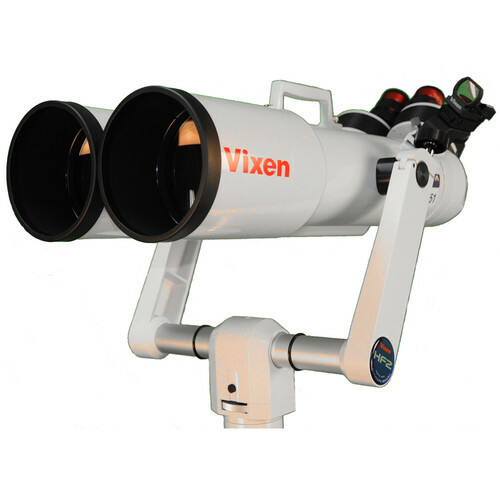 Vixen Optics designed their XY Dot Finder as a faster alternative to conventional magnified finderscopes. This unmagnified optic puts a red dot in the center of the sighting window that, when properly aligned with your optical tube, allows you to simply cover your target object with it and have it centered in your OTA's eyepiece. This design allows you to see the entire night sky above you for faster scanning and movement versus conventional finderscopes that limit your field of view. With eleven settings, controlled by an easy to use rheostat dial, the dot intensity can be set at the most comfortable brightness so you can see the dot without affecting your night-adjusted vision. This dot finder comes with an aluminum mounting bracket that is compatible with all Vixen OTAs and one CR2032 battery. This HF2 Altazimuth Fork Mount from Vixen is an altazimuth mount that's designed for use with large astronomical binoculars. The fork mount can be fixed to most sturdy tripods with a 3/8"-16 mounting-stud, including Vixen's HAL130-GP and HAL130-SX tripods. To complete the assembly, an appropriate swing bracket must be attached to the binocular. The HAL 130SXG Aluminum Tripod from Vixen Optics is compatible with Vixen's Sphinx and GP telescope mounts. 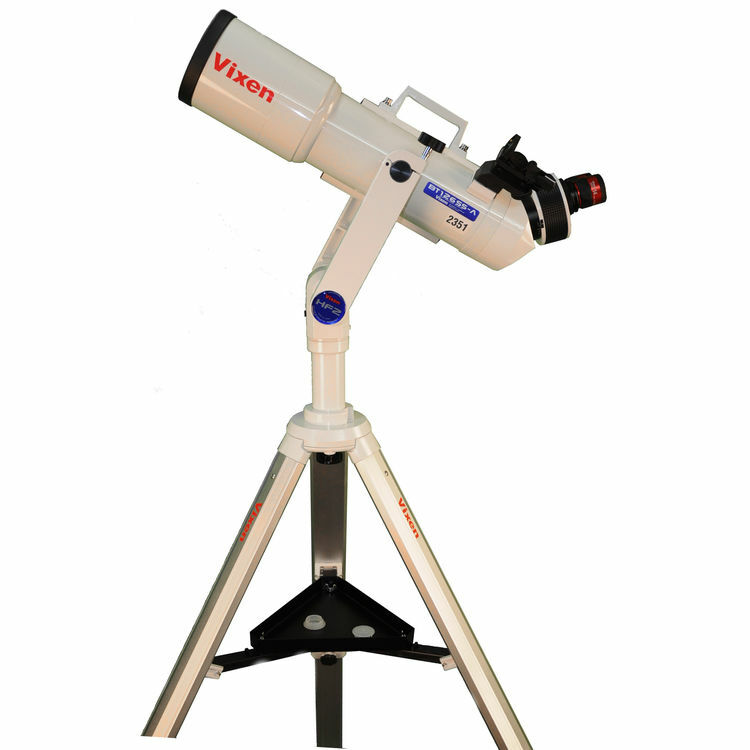 The adjustable height allows the user to set the position of the telescope to their liking for easy and comfortable viewing. The top of the tripod, where the mount attaches, is powder-coated for a durable finish that resists flaking and fading. The tripod is also collapsible for convenient storage and portability. This Metal Tripod Tray holds your observing accessories and lock the tripod legs into place. It fits Vixen and other branded tripods (bolt holes are spaced about 9.5"/241mm apart), including current aluminum tripods for the GP, SP, GP-DX, Sphinx, Porta & Custom-D mounts. Interpupillary Adjustment 55.88 - 101.60 mm / 2.2 - 4.0"
Box Dimensions (LxWxH) 4.7 x 2.4 x 2.2"
Box Dimensions (LxWxH) 12.598 x 9.449 x 1.732"